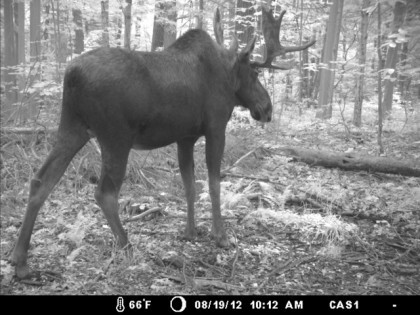 The motion-activated trail camera at our Richard G. Croft Memorial Preserve, in Goshen, captured some amazing photos of the resident family of moose (a male with a beautiful rack of antlers, one or two females, and a calf) recently. Here’s one of the photos. You can see more, along with a closeup of a bear face, on our other blog, here. Photo copyright Connecticut Audubon Society. The Croft preserve is wild with no facilities and only a rudimentary trail. We’re starting to plan a public hike of the preserve for sometime in late fall or early winter.